You are currently browsing the archive for the Games category. So far we have only considered blind strategies and a simple greedy strategy based on maximizing our score on every move. The results were interesting because the blind cyclic strategy left-down-right-down did surprisingly well and we saw that a biased random strategy which strongly favored two orthogonal moves like left and down with a small amount of one other move like right outperformed all of the other biased random strategies. If we want to do better, we need something more sophisticated than a blind strategy or pure, short-term, score greed. If you can win on your next move, then do it. If your opponent has two in a row, then block his win. Take the center square if you can. Take a corner square if it is available. 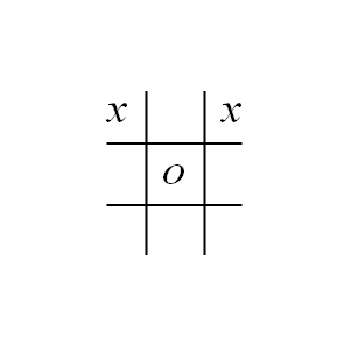 Try to get two squares in a single row or column which is free of your opponent’s marks. Move randomly if no other rule applies. Though this approach can be rather successful, it tends to be hard to modify because it is brittle. It is brittle in two ways: a new rule can totally change the behavior of the entire system, and it is very hard to make a tiny change in the rules. These kind of rule based systems matured and incorporated reasoning in the nineties with the advent of “Expert Systems“. Long before the nineties, the first game AI programmers came up with another idea that was much less brittle. If we could just give every position a numerical rating, preferably a real number rather than an integer, then we can make small changes by adding small numbers to the rating for any new minor feature that we identify. Add 1 point for every row, column, or diagonal in which I have two squares and my opponent has no squares. 2 (for the upper left corner x) + 2 (for the other corner) + 1 (for the top row) = 5.
then we would have six possible moves. Each move could be rated using our board rating system, and the highest rated board with x in the center and a rating of 8 would be chosen. 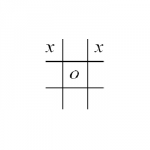 This approach was first applied to computer game AI by the famous theoretician Claude Shannon in the paper “Programming a Computer for Playing Chess” (1949), but the idea without the computers actually predates Shannon by hundreds of years. For instance, the chess theoretician Giambatista Lolli published “Osservazioni teorico-pratiche sopra il giuoco degli scacchi ossia il Giuoco degli Scacchi” in 1763. He was the first to publish the idea of counting pawns as 1, bishops as 3, knights as 3, rooks as 5, and queens as 9 thereby giving a rating to every board position in chess (well, at least a rating for the pieces). Shannon modified this rating by subtracting 0.5 for each “doubled” pawn, 0.5 for each “isolated” pawn, 0.5 for each “backward” pawn, and adding 0.1 for each possible move. Thus, if the pieces were the same for both players, no captures were possible, and if the pawns were distributed over the board in a normal fashion, Shannon’s chess AI would choose the move which created the most new moves for itself and removed the most moves from his opponent. Shannon significantly improved on the idea of an evaluation function by looking more than one move ahead. In two players games, the main algorithm for looking a few moves ahead before applying the evaluation function is the alpha-beta search method which will be tested in a later post. Let’s try to find and test a few evaluation functions for 2048. “There is an art to flying, or rather a knack. Its knack lies in learning to throw yourself at the ground and miss. … Clearly, it is this second part, the missing, that presents the difficulties.” (HG2G). 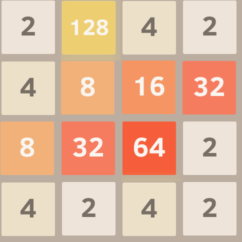 Suffice it to say that in 2048, the longer you delay the end of the game (hitting the ground), the higher your score (the longer your flight). 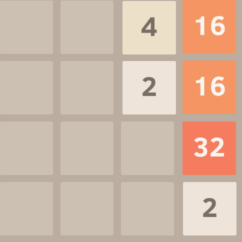 The game ends when all of the squares are filled with numbers, so if we just count every empty square as +1, then the board rating must be zero at the end of the game. I ran 1000 simulated games with the Empty Tile evaluation function and got an average ending tile total of 390. The strategy ended the games with a maximum tile of 512 tile 25 times, a 256 tile 388 times, 128 491 times, 64 92 times, and 32 4 times. Once again I ran a 1000 games using smoothness as an evaluation function. The average ending tile total was 720, a new high. The strategy had a maximum ending tile total of 1024 3 times, 512 263 times, 256 642 times, 128 87 times, and 64 5 times. This looks very promising. 4 > 2 < 4 > 0 is not sorted. The second 2 < 32 > 0 = 0 and forth 4 < 16 > 0 = 0 rows are sorted only if the spaces are ignored. The third row 2 < 16 < 64 < 128 is fully sorted. Let’s measure the degree of monotonicity by counting how many times we switch from a less than sign to a greater than sign or vice-versa. For the first row we get 2 changes because the greater than sign 4 > 2 changed to a less than sign 2 < 4 and then changed again in 4 > 0. We also get two changes for 2 < 32 > 0, no sign changes in the third row (perfectly monotonic), and two changes in the last row. I ran 100 games using the monotonicity evaluation function. The average ending tile total was 423. The maximum tile was 512 16 times, 256 325 times, 128 505 times, 64 143 times, and 32 11 times. I have summarized the results of these three simple evaluation functions in the table below. Well, clearly Smoothness was the best. There are three great advantages to numerical evaluation functions over if-then based rules. One, you can easily combine completely different evaluation functions together using things like weighted averages. Two, you can plot the values of evaluation functions as the game proceeds, or even plot the probability of winning against one or two evaluation functions. 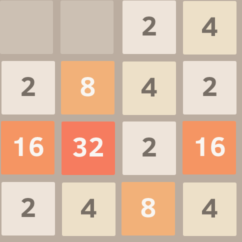 Three, in 2048, there is the uncertainty where the next random tile will fall. With numerical evaluation functions, we can average together the values of all the possible boards resulting from the random tile to get the “expected value” (or average value) of the evaluation function after the random tile drop. Well, that’s it for my introduction to evaluation functions. Next time we will focus on more sophisticated evaluation functions and the powerful tree search algorithms that look more than one move ahead. 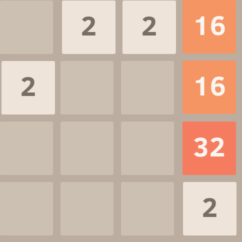 An AI for 2048 — Part 1 – which described the game 2048 and reported the results of pure random play and a very simple greedy strategy that just tried to maximize it’s score on every move. 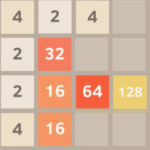 An AI for 2048 — Part 2 Cyclic Blind Strategies – which reported on strategies that just cyclically repeated the same key stokes. In this article, I will make some comments on the cyclic blind strategies and report on random blind strategies. The cyclic results can be generated from the Mathematica source code that I posted earlier. The Biased Random results below can be obtained by just modifying the strategy function in the Mathematica source code. All four directions alternating vertical and horizontal (dlur, drul) 420 AETT. All four directions without alternating vertical and horizontal (durl, dulr, dlru, …) 270 AETT. One Horizontal Direction + One vertical direction with or without repetition 60 AETT. where T was the total of L, R, U, and D, and L, R, U and D between 0 and 4. 11.138   16   1. 0. 0. 0. 55.416   128  0.57  0. 0.43  0. 56.33    128  0.67  0. 0.33  0. 57.17    64   0.5   0. 0.5   0. 57.732   128  0.6   0. 0.4   0. 70.93    16   0.6   0.4   0. 0. 71.246   32   0.57  0.43  0. 0. 71.294   32   0.5   0.5   0. 0. 71.752   32   0.67  0.33  0. 0. 245.49   256  0.44  0.44  0.11  0. 254.002  512  0.5   0.38  0.12  0. 257.468  512  0.43  0.43  0.14  0. 258.832  256  0.57  0.29  0.14  0. 271.676  512  0.5   0.33  0.17  0. 281.958  256  0.4   0.4   0.2   0. 291.702  512  0.44  0.33  0.22  0. 306.404  256  0.38  0.38  0.25  0. 306.508  512  0.5   0.25  0.25  0. 310.588  512  0.43  0.29  0.29  0. 310.596  512  0.36  0.36  0.27  0. 321.016  512  0.4   0.3   0.3   0. 333.788  512  0.33  0.33  0.33  0. 340.574  512  0.5   0.17  0.33  0. 341.238  512  0.57  0.14  0.29  0. 342.318  512  0.44  0.22  0.33  0. 347.778  512  0.36  0.27  0.36  0. 355.194  512  0.38  0.25  0.38  0. 366.72   512  0.5   0.12  0.38  0. 369.35   512  0.43  0.14  0.43  0. 371.63   512  0.4   0.2   0.4   0. 384.962  512  0.44  0.11  0.44  0. There are a few things you might notice. The best strategy was 44% Left, 11% Right, and 44% down with a AETT of 385 which was much better than pure random (25% in each direction), but not nearly as good as the cyclic strategy left-down-right-down (AETT 686). The AETT varies smoothly with small changes in the strategy. This is not surprising. You would think that 55% up, 45% down would have nearly the same result as 56% up and 44% down. The Extreme value theorem then tells us that there must be a best possible random biased strategy. The top 17 strategies in the table prohibit one direction with AETTs of 280 to 385. If the strategy uses just two directions, then it does very poorly. Well that’s it for blind strategies. Over the next few posts, we will introduce evaluation functions, null moves, quiescent search, alpha-beta prunning, and expectimax search. A guy named Phil asked me to post my code, so here it is. It’s in Mathematica, so I imagine that most people will have trouble reading it. I will probably rewrite the code in a more common, faster language later. Performs one turn of the game. is either a number 2, 4, 8, ... or the string ".". characters u, d, l, r.
Random play will achieve an average ending tile total (AETT) of 252 and usually the highest tile will be a 64 tile or a 128 tile (about an 85% chance of ending with one of those). A pure greedy strategy where the player just tries to make the largest new tile possible results in an average ending tile total (AETT) of 399 and usually the highest tile will be a 128 tile or a 256 tile (about an 87% chance of ending with one of those). Perhaps surprisingly, there are “blind” strategies that will do even better than the pure greedy strategy. Blind strategies are strategies that ignore the current state of the board. I tried two types of simple blind strategies “biased random” and “repeating sequences”. I will summaries the results of the biased random trials in my next post. The simplest repeating strategy would be just hitting the same key every time—down, down, down, …. Of course that does not do well. Nor would down, up, down, up, …. So the simplest repeating strategy worth trying would be down, right, down, right or some other combination of horizontal and vertical moves. I ran 100 games for every possible repeated sequence of two to four moves and found that the best of these sequences was down, right, down, left or a version of that sequence in disguise. The results are captured in the table below. Notice that restricting your moves to only two out of the four possibilities does poorly. The Down, Left, Down, Left… strategy had an average tile total of only 44.38 at the end of the game and that strategy never created a tile above 64. The best strategies were down-right-down-left or that same strategy in disguise (dlul, dldr, and drur are really the same strategy). Notice that this strategy does better than pure greedy which had an AETT of 399. So I played the game 2048 and thought it would be fun to create an AI for the game. I wrote my code in Mathematica because it is a fun, terse language with easy access to numerical libraries since I was thinking some simple linear or logit regression ought to give me some easy to code strategies. The game itself is pretty easy to code in Mathematica. The game is played on a 4×4 grid of tiles. Each tile in the grid can contain either a blank (I will hereafter use a _ to denote a blank), or one of the numbers 2,4,8,16,32,64,128, 256, 512, 1024, or 2048. On every turn, you can shift the board right, left, up, or down. When you shift the board, any adjacent matching numbers will combine. 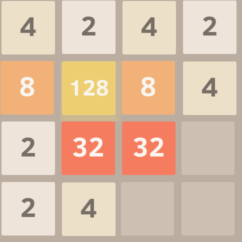 The object of the game is to get one 2048 tile which usually requires around a thousand turns. Here’s an example. Suppose you have the board below. If you shift right, the top row will become _, _, 4, 16, because the two twos will combine. Nothing else will combine. Shifting left gives the same result as shifting right except all of the tiles are on the left side instead of the right. If we look back at the original image (below), we can see that there are two sixteen tiles stacked vertically. So the original board (above) shifted down combines the two sixteens into a thirty-two (below) setting some possible follow-up moves like combining the twos on the bottom row or combining the two thirty-twos into a sixty-four. There are a few other game features that make things more difficult. 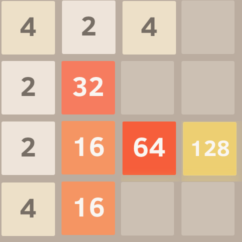 After every move, if the board changes, then a two or four tile randomly fills an empty space. So, the sum of the tiles increases by two or four every move. The first strategy I tried was random play. A typical random play board will look something like this after 50 moves. If you play for a while, you will think that this position is in a little difficult because the high numbers are not clumped, so they might be hard to combine. A typical random game ends in a position like this one. In the board above, the random player is in deep trouble. His large tiles are near the center, the 128 is not beside the 64, there are two 32 tiles separated by the 64, and the board is almost filled. The player can only move up or down. 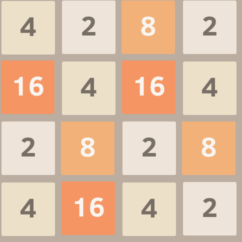 In this game the random player incorrectly moved up combining the two twos in the lower right and the new two tile appeared in the lower right corner square ending the game. I ran a 1000 random games and found that the random player ends the game with an average tile total of 252. 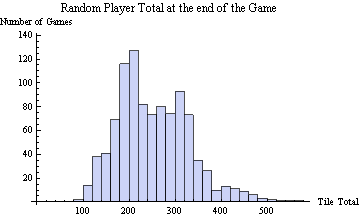 Here is a histogram of the resulting tile totals at the end of all 1000 games. The random player’s largest tile was 256 5% of the time, 128 44% of the time, 64 42% of the time, 32 8% of the time, and 16 0.5% of the time. It seems almost impossible to have a max of 16 at the end. Here is how the random player achieved this ignominious result. So what’s a simple improvement? About the simplest possible improvement is to try to score the most points every turn—the greedy strategy. You get the most points by making the largest tile possible. 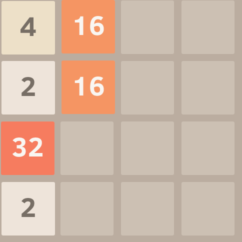 In the board below, the player has the options of going left or right combining the 32 tiles, or moving up or down combining the two 2 tiles in the lower left. 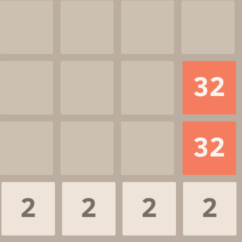 The greedy strategy would randomly choose between left or right combining the two 32 tiles. The greedy action avoids splitting the 32 tiles. I ran 1000 greedy player games games. The average tile total at the end of a greedy player simulation was 399—almost a 60% improvement over random play. 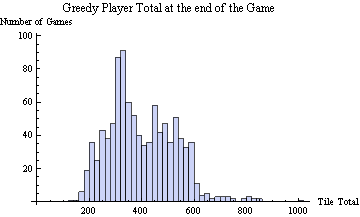 Here is a histogram of the greedy player’s results. If you look closely, you will see that is a tiny bump just above 1000. In all 1000 games, the greedy player did manage to get a total above 1000 once, but never got the elusive 1024 tile. He got the 512 tile 2% of the time, the 256 tile 43% of the time, the 128 44%, the 64 11%, and in three games, his maximum tile was 32. I ran a number of other simple strategies before moving onto the complex look ahead strategies like UCT. More on that in my next post. What would you do with 2880 cores? Vasik Rajlich, author of the legendary chess program Rybka, used them to show that chess champion Bobby Fisher was right about the chess opening King’s Gambit (see “A bust for King’s Gambit“) . Vasik proved that King’s Gambit is a loss for white unless white plays 3. Be2 after black takes the pawn. (In that case, it’s a draw.) For the details, click on the link below. So I have been learning a little category theory in the hopes that I could use it somehow to teach computers abstraction. 1a) An average model of a large group of similar things. For example, the abstraction of a chair might be an idealized chair with a seat, a backrest, four legs, and possibly “strechers” between the legs to give it strength and stability. L2 $\approx$ L1 – LC*N + LC + N.
Though this example is not in any way practical, it does illustrate how a function can capture commonality. All of the pieces of code replaced by the pr function had a call to printf, the substring “Hello “, and the carriage return “\n”. The pr function was, in a sense, the idealized version of the six print statements in the original code. In category theory, we could refer to the category of strings with arrows going from superstrings to substrings. In this category, there would be an arrow from the line of code ” printf(“Hello John\n”);” to the string ” printf(“Hello \n”);”. The categorical coproduct of several strings in this category would be the longest common substring. So, category theory suggests the substring ” printf(“Hello \n”);” should somehow be included in the abstraction of those six printf statements in the original code. 2) A simplifying transformation that changes things into simpler things which are easier to work with. For example, if you are counting sheep in a pen, you might convert groups of sheep into numbers and then add the numbers to get a total count for the entire pen. We simplified the counting process by first converting groups of sheep into numbers. Another example might be solving a corn maze by first flying over it, taking a picture, and then converting the “impassable” rows of corn into lines drawn on a piece of paper. To solve the corn maze, you first convert it to a pen drawing on paper and then solve the pen drawn maze. 3) Removing irrelevant information or detail. If a piece in chess is attacking the opponent’s king, then the opponent must either a) move the king, b) put a piece between the attacker and the king, or c) capture the attacking piece. If you wanted to list the possible moves for the opponent, you can often delete from the chess board most of the pieces because most of the pieces on the board do not affect the three options above. In the diagram below, the white pawns, rook, and king and the black pawn on a7 do not affect the legal moves for black. In a corn maze, the type of corn, the height of the corn stalks, the temperature, or the type of soil do not affect the solution of the corn maze, so that information could be ignored. Ignoring irrelevant information allows the brain to form a more abstract, simple model of the corn maze. 4) Variables in first order predicate logic. “If person A is taller than person B and person B is taller than person C, then person A is taller than person C.” In that statement, person A could any one of a billion people on earth. 5) Establishing classes of objects. “Fruit tends to spoil quickly.” That statement applies to a huge variety of organic objects. Abstraction classes can even be put in a hierarchy like Animal ==>> Mammal ==> Cat ==> Siamese Cat. the capital letter I frequently appears with spaces on either side. These patterns are all mini-abstractions or aspects of English. A very general notion of abstraction could be any function which shortens the compression of data. That function could be an abstraction of some part of the data. If your data consisted of 3 dimensional models of chairs, then a compression program could use the fact that a chair usually has four legs, a seat, and a backrest. A compression program might benefit from a function like the one shown below. The abstract version of a chair would help compress the data describing many chairs. A compression program for a corpus of chess games would probably include a board evaluation function. The program could use the evaluation function to suggest the top five most likely moves. This would allow the program to use less space to compress the moves by using a probability distribution (e.g. arithmetic encoding) over moves as a function of the “goodness” of each move. Better moves would be more likely than worse moves. Converting the positions to valuations helps the computer to compress by making it “understand” chess. If the computer is compressing many chess games, it may even note that some human players were more aggressive players or stronger players. By classifying the players by skill or behavior, the program achieves better compression. Hopefully, sometime in the future, I will be describing how category theory can help us automate those six abstractions and then use the abstractions to generate features for learning algorithms. One of my friends showed me his new gaming computer and said that the GPU could do 1.3 teraflops (1.3 trillion floating point operations per second) which is about 500 times faster than my home computer, so I thought, “Imagine how quickly we could search a game tree.” So I started looking around the internet for a super-great GPU chess engine and found basically nothing!! Turns out that the amount of memory per thread is too low, the size of the L1 cache is too small, and the alpha-beta pruning algorithm is not quite parallel enough for GPUs to play chess well. Here is a nice graphic of the L1 access time for a few CPUs and GPUs. In the paper “Parallel Game Tree Search Using GPU” (2011), L’ubomír Lackovic improved the tree search speed by a factor of two to three by using a GPU instead of the more traditional CPU based tree search for Czech draughts (similar to American Checkers). His tests were based on the ATI Radeon 4890 GPU, the Nvidia GTX460 GPU, and the quad-core processor Intel i5 750 CPU. I had hoped for more speed. “The observed speed-ups of over one order of magnitude have been obtained (plotted in bold font), exceeding the number of cores on most current PCs. Note that this assertion is true for the dual 6-core CPUs available from Intel, but not on a dual Xeon machine with two quad-core CPUs creating 16 logical cores due to multi-threading. Nonetheless, better speed-ups are possible since NVIDIA GPUs can be used in parallel and the Fermi architecture (e.g. located on the GeForce GTX 480 graphics card) is coming out which will go far beyond the 240 GPU cores we had access to. So GPU’s are not the silver bullet for games yet. In “A Neuro-evolution Approach to General Atari Game Playing“, Hausknecht, Miikkulainen, and Stone (2013) describe and test four general game learning AIs based on evolving neural nets. They apply the AIs to sixty-one Atari 2600 games exceeding the best known human performance in three of the sixty-one games (Bowling, Kung Fu Master, and Video Pinball). 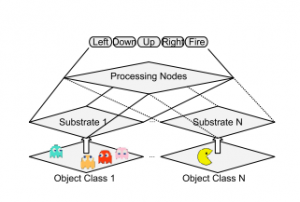 This work improves their previous Atari gaming AI described in “HyperNEAT-GGP: A HyperNEAT-based Atari General Game Player” (2012) with P. Khandelwal. The Atari 2600 presents a uniform interface for all its games: a 2D screen, a joystick, and one button. The Atari 2600 games are simulated in the Arcade Learning Environment which has allowed several researchers to develop AIs for the Atari. All of the algorithms evolved a population of 100 individual neural nets over 150 generations mostly using the topology shown below. Russian mathematician Alexander Kronrod was credited for first stating that “chess was the drosophila of artificial intelligence” in 1965 to justify the use of expensive computers for playing chess. In 1946, Turing suggested that chess playing computers would be an example of a thinking machine and in 1953 he wrote the first program that could play chess; however, there were no computers around that could run his program. In 1950, Claude Shannon wrote the first paper on chess algorithms and proposed two main approaches: type ‘A’ brute force minimax search and type ‘B’ which used heavy heuristics to carefully examine a much smaller number of positions. Type ‘A’ turned out to be superior for chess and governed the vast majority of chess computer research. Shannon introduced the terms “ply” and “pruning”. Unlike the drosophila in genetics research, the simplistic minimax algorithm never lead to improved theoretical understanding in AI and may have even hindered the progress of AI.